In this section, you enter the initial standard dimensions for appliances. Notice that in some cases you are entering the appliance widths (+) plus clearance and not the actual widths. Choose an Appliance to Configure: Click in the list box on the left and select the appliance you want to configure. The default dimensions will automatically appear on the right for that selected appliance. Depth: Enter the actual depth of the selected appliance. Floor to Btm: Enter the actual distance off the floor to the bottom of the selected appliance. 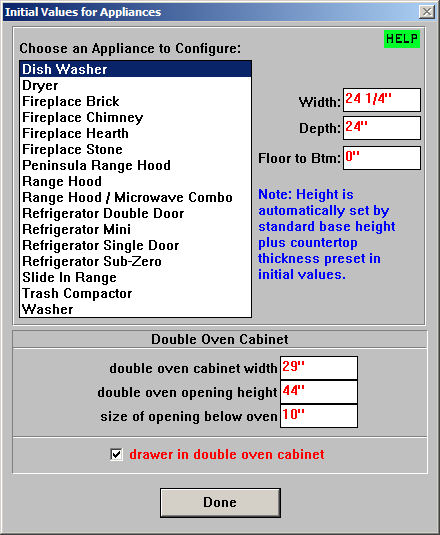 Double Oven Cabinet Width: Enter the actual depth of the selected appliance. Size of Opening Below Oven: Enter the size of the opening below the oven. If drawer in Oven Cabinet is selected, a drawer for pots and pans is placed in this opening. Drawer in Double Oven Cabinet: Check this box to place a drawer below the opening for a Double Oven Cabinet. Small pictures (icons) of cabinets are located in the tool box to the right of the drawing screen in the Place Cabinets Screen. The icons represent the different types (or templates) of cabinets and appliances that you can place on the walls of your rooms but they are not stock cabinets. Each cabinet template when selected, can be given any custom size you choose. You can set the number of shelves to whatever you like and that cabinet will be constructed using the standards that you've selected. In the Edit Elevations Screen you can customize these cabinets even further and learn how to make your own custom library of cabinets. Standard Base Cabinet: represents a standard base cabinet with one drawer on top and a door below. If the cabinet is sized so that the door opening is greater than 24", Cabinet Solutions automatically places a pair of doors over the opening. Standard Drawer Bank: represents a standard drawer bank. It will be created with the number of drawers that you have specified in the job standards. Extended End Base Cabinet: represents an extended end base cabinet. You may be more familiar with the term "blind corner" cabinet. Extended ends are the same thing. Angle Corner Cabinets: represents an angled corner cabinet. These are corner cabinets with faces that typically go at a 45 degree angle from one wall of cabinets to another. Notice: the angle of the cabinet face will automatically be calculated for you. Cabinet Solutions uses the depth of the cabinets on both sides of the angle corner cabinet and angles the cabinet face so that it matches up on both sides. When selected, another window opens giving you a choice between an angle corner upper or base. For a diagram on how to build these cabinets, click here. Angle Corner upper: represents an angled corner upper. Angle Corner Base: represents an angled corner base. "L" Corner Cabinets: represents a corner cabinet with a face that has a 90 degree notch in it, giving the whole cabinet a "L" shape. When selected, another window opens giving you a choice between an "L" corner upper or base. "L" Corner Upper: represents an "L" corner upper. "L" Corner Base: represents a "L" corner base. Standard Upper Cabinet: represents a standard upper cabinet. Refer Upper Cabinet: represents the upper cabinet over the refrigerator. Extended End Upper Cabinet: represents an extended end upper cabinet. You may be more familiar with the term "blind corner" cabinet. Extended ends are the same thing. Hood Cabinet: represents the hood cabinet above the stove. Notice that the hood cabinet has it's own standards that it uses when it is accessed. Filler Types: There are times when a space that is left over cannot be filled with a cabinet. Because of the position of an appliance, such as a dishwasher, a filler is needed. When this icon is selected a window opens that allows you to select a base filler or an upper filler. Filler Upper: represents a filler piece to be placed in the upper. Filler Base: represents a filler piece to be placed in the base. Radius Cabinets: represents the radius cabinets. When selected, a choice between the following radius cabinets is given. For Radius End and Peninsula cabinets, you will want to make the width of the cabinet whose end is to be a radius (ex. a standard base cabinet) short the width of the radius. Then, make the radius cabinet the width of the radius and place it at the end of the cabinet whose end is to be a radius. In Initial Values under Radius and Clipped Cabinets, you have the option to include an unfinished end panel or to leave it out. If you include it, you will have a double panel between the cabinet and the radius end. For diagrams on how to build the radius for these cabinets, click here..
Radius Upper: represents a standard radius upper. Radius Base: represents a standard radius base. Radius Corner Upper: represents a radius corner upper. Radius Corner Base: represents a radius corner base. Radius Left End Upper: represents a radius left end upper to be placed on the left of the cabinet whose end is to be a radius. Radius Left End Base: represents a radius left end base to be placed on the left of the cabinet whose end is to be a radius. Radius Left Peninsula End Upper: represents a radius left peninsula end upper to be placed on the left of the cabinet whose end is to be a radius. Typically, this cabinet is used on a peninsula or island wall. Radius Left Peninsula End Base: represents a radius left peninsula end base to be placed on the left of the cabinet whose end is to be a radius. Typically, this cabinet is used on a peninsula or island wall. Radius Right End Upper: represents a radius right end upper to be placed on the right of the cabinet whose end is to be a radius. Radius Right End Base: represents a radius right clipped end base to be placed on the right of the cabinet whose end is to be a radius. Radius Right Peninsula Upper: represents a radius right peninsula end upper to be placed on the right of the cabinet whose end is to be a radius. Typically, this cabinet is used on a peninsula or island wall. Radius Right Peninsula Base: represents a radius right peninsula end upper to be placed on the right of the cabinet whose end is to be a radius. Typically, this cabinet is used on a peninsula or island wall. Clipped Cabinets: represents the clipped cabinets. When selected, a choice between the following clipped cabinets is given. For Clipped End cabinets, you will want to make the width of the cabinet whose end is to be clipped (ex. a standard base cabinet) short the width of the clip. Then, make the clipped cabinet the width of the clip and place it at the end of the cabinet whose end is to be clipped. In Initial Values under Radius and Clipped Cabinets, you have the option to include an unfinished end panel or to leave it out. If you include it, you will have a double panel between the cabinet and the clipped end. Clipped Left End Upper: represents a clipped left end upper to be placed on the left of the cabinet whose end is to be clipped. Clipped Left End Base: represents a clipped left end base to be placed on the left of the cabinet whose end is to be clipped. Clipped Right End Upper: represents a clipped right end upper to be placed on the right of the cabinet whose end is to be clipped. Clipped Right End Base: represents a clipped right end base to be placed on the right of the cabinet whose end is to be clipped. Sink Base Cabinet: represents a sink base cabinet. This cabinet has the feature of automatically centering itself under a window. Vanity Cabinets: represents the vanity cabinets (or bath cabinets.) When selected, a choice between the following three vanity cabinets is given. Vanity Sink Base: represents a vanity sink base. Vanity Base Cabinet: represents a vanity base cabinet. Vanity Drawer Bank Cabinet: represents a vanity drawer bank with the specific number of drawers in it that you have set in your standards. Space Base Cabinets: This is not a cabinet but it works as a space holder that cannot be overlapped. There are times when you need a space left, maybe because the customer has not decided yet what to put in a space. When this icon is selected a window opens that allows you to select a base space or an upper space. Space Base: represents a space to be placed in the base. Space Upper: represents a space to be placed in the upper. Full Height Pantry: represents a full height cabinet. It can be used as a pantry in a kitchen or a linen cabinet in a laundry room. You can even modify it to become a bookcase or an entertainment center. Double Oven Cabinet: represents a double oven cabinet. This cabinet will be created with an opening for a double oven based on the information you set in the job standards. Appliances: click the appliance button to open a dialog box with various built-in appliances you can use. Dishwasher: represents a dishwasher plus the clearance that this model of dishwasher needs. Dryer: represents a dryer with back panel plus the clearance that this model of dryer needs. Fireplace Brick: represents a brick fireplace plus the clearance that this model of brick fireplace needs. Fireplace Chimney: represents a brick fireplace chimney plus the clearance that this model of chimney needs. Fireplace Hearth: represents a brick fireplace hearth plus the clearance that this model of hearth needs. Fireplace Stone: represents a modern stone fireplace plus the clearance that this model of stone fireplace needs. Range Hood: represents a range hood plus the clearance that this model of range hood needs. Microwave/Range Hood Combo: represents a microwave on top of a range hood plus the clearance that this model of microwave/range hood combo needs. Refrigerator Double Door: represents a double door refrigerator plus the clearance that this model of refrigerator needs. Refrigerator Mini: represents a mini refrigerator plus the clearance that this model of refrigerator needs. Refrigerator Single Door: represents a single door refrigerator plus the clearance that this model of refrigerator needs. Refrigerator Sub-Zero: represents a sub-zero refrigerator plus the clearance that this model of refrigerator needs. Slide in Range: represents a slide in range,plus the clearance that this model of range needs. Trash Compactor: represents a trash compactor plus the clearance that this model of trash compactor needs. Washer: represents a washer with back panel plus the clearance that this model of washer needs. Custom Cabinets: represents custom cabinets. You can create and save a unique cabinet by editing standard cabinets in the "Edit Elevations Screen" and then saving the cabinet as a custom cabinet. The custom cabinets you have created and saved will appear in a list when you select the custom cabinets icon.